I'm getting ready to leave for my trip to Vegas with my friend, Jenny (aka Thelma). We're staying at the Monte Carlo. I've never stayed there before but I've visited their brew pub many times...hee hee hee. Jenny has never been to Vegas so I've got a whole list of things we must see and do. Bill is driving us to the airport. He's staying home to watch Greta to make sure she behaves herself...hee hee hee. We saw Jersey Boys at The Fox today. This was the last show in the Broadway Series. The story was about Frankie Valli and the Four Seasons. Since they were a little before my time, I didn't think that I would know many of the songs but I was surprised. They sang Oh What a Night, Sherry, Big Girls Don't Cry, Walk Like a Man, Can't Take My Eyes Off of You and Who Loves You, just to name a few. Oh, and yes Charlie, Frankie Valli did sing Grease! So there! Anyway, we really enjoyed the show. We are planning to buy season tickets to The Fox Broadway series again next year. It used to be called Secretary's Day but since there is no such thing as a secretary anymore, it has become known as Administrative Professionals Day. Secretaries are now Administrative Assistants or "Admins" for short. Anyway, Bill department doesn't really have any Admins so the managers give cards and gifts to all of the accounting clerks. He asked me to make cards for the three clerks who report to him. 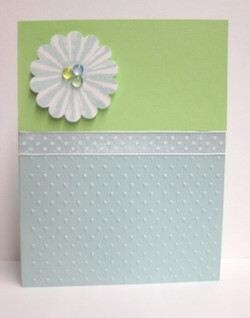 I used the Cuttlebug Swiss Dots folder (one of my faves) to emboss the bottom of the card and I added some of my new Dew Drops to the center of the flower. 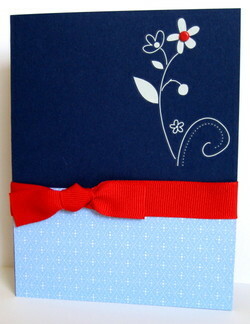 I love how the dotted ribbon coordinates with the embossing. Yes, I'm wonderful...hee hee hee. The weather has been wonderful for the past four days. I think Spring is officially (and finally) here. As you probably know, there was an earthquake here in the Midwest on Friday morning. The epicenter was in Mt. Carmel, IL which is about 125 miles east of St. Louis. It occurred at 4:36am and I slept right through it...hee hee hee. It woke Bill up but I'm a pretty sound sleeper. There was an aftershock at 10:16am and I didn't feel that one either. I've only felt one earthquake in my life. I think I was about 18 or 19 and it occurred around 11:30pm one night. I thought it was a big truck driving down the street but when the shaking continued, I realized what it was. It was kind of freaky! I guess it's a good thing I don't live in California. We had tickets to the Cardinals game Friday night. It was raining and we decided that we just didn't want to deal with walking through the rain (the parking lot where we park is about 4 blocks from the stadium) and then try to find a place to stay dry so we skipped the game and went to Alandale Brewing for dinner. Well, it turns out that the rain did stop and the game started about 30 minutes late. We ended up watching the game at home. It was definitely a taste of Spring today. The high temperature was 72 degrees and it was nice and sunny. We did a little yard work today, cleaning up the flower beds and such. I can't wait to start planting flowers. As promised, here is one of the cards I created a few weeks ago but never posted. I used the rub-on set from Sale-A-Bration. Rub-ons are really fun to use. The only problem is once they're gone, they're gone. I told myself that I need to get over it and just use them...hee hee hee. Anyway, I added a red brad to the center of the flower to give it a little added color. I really like how it turned out. Since I didn't stamp a sentiment on the card, it really could be used for just about anything such as a birthday, thank you, thinking of you, etc. I was in Atlanta on business for the past couple of days. I didn't actually get to see much of the city but I was able to check out a local brew pub called Max Lager's. Delicious gumbo and peanut sesame chicken skewers. I tried the Max APA and the Max Irish Stout. Both were great. I stayed at the Sheraton W. It is very, very nice. It was within walking distance of the Marta station as well as the office I was visiting so it was very convenient. Riding Marta was a breeze. I rode it to the hotel and back to the airport with no problems at all. We have tickets for the Cardinals game tomorrow. It supposed to rain but hopefully it will stop long enough so that they can play ball. The flower from Heartfelt Thanks set is one of my favorite images. 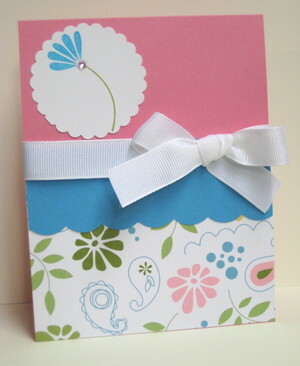 For this card, I used Brocade Blue for the flower and Certainly Celery for the stem and leaves. 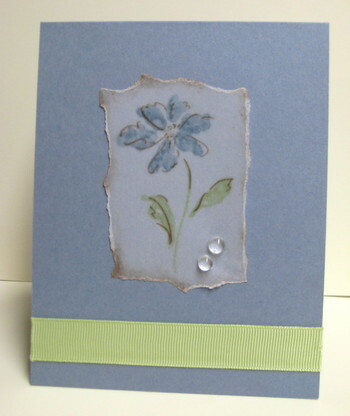 Dew Drops and Certainly Celery ribbon were added as an accent. By the way, a few snowflakes fell today. The calendar says that it's Arpil but apprarently the clouds say otherwise. Oh well...it's supposed to warm up this week. We ate dinner at Trattoria Marcella last night. We had never eaten there before but I researched it online and all of the reviews were outstanding so we decided to give it a try. It was excellent! We started with the stuffed artichoke for an appetizer. It was stuffed with couscous, parmesan and pine nuts. For our entrees, I had the pumpkin ravioli with rosemary cream sauce. It was so yummy. Bill had the signature dish, the lobster risoto. We also ordered some paremsan polenta fries. Everything was outstanding and we will definitely go back again. Looks like a rainy weekend is in store for us. Oh well, I won't complain. At least it's not snow. As you probably know, I love glitter and sparkle. I don't like gaudy sparkle, just enough to make it pretty. For this ATC, we were required to use bling and/or sparkle. 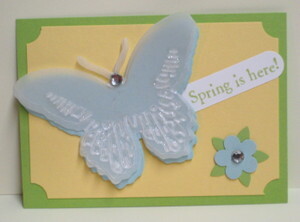 I used the Cuttlebug Butterfly die and embossing folder which I absolutely love. I am so glad I bought it. They also have a heart die and embossing set but, as much as I love hearts, I decided to get the butterfly one instead because I think it's more versatile. Anyway, it's somewhat difficult to see in the picture, but I added sparkle to the embossed part of the wings. I used a rhinestone for his head and the center of the flower. It is my friend Jenny's birthday today. 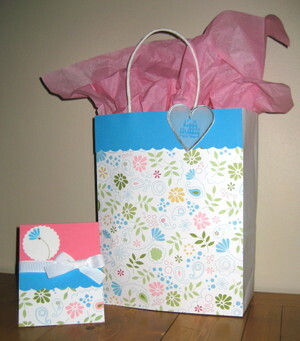 This is the card and gift bag I made for her. I actually made the gift bag first and then made the card to match. I don't seem to make gift bags often, usually just a few at Christmas and maybe three or four others throughout the year. It was fun making this one so maybe I should plan to make them more often. Rumor has it that Jenny is going to Vegas in a few weeks. Sounds like fun! 75 years ago today on April 7, 1933 at 12:01 am, the 18th amendment was repealed. After 13 long years, beer was once again legal. Oh happy day! Anheuser Busch, which had been producing non-alcoholic "near beer" during prohibition, sent a case of Budweiser to President Roosevelt as a "thank you" for putting an end to prohibition. A fact that I did not know until today; Anheuser Busch introduced the Clydesdales on April 7, 1933 in celebration of the end of prohibition. Living in St. Louis all my life, I've had many opportunities to see these wonderful horses. They have become synonymous with beer and baseball.